After years of teasers and trailers, the 2018 Jeep Wrangler known as the “JL” is finally officially being revealed and detailed at the Los Angeles Auto Show. Here’s a quick run through some of the new Jeep’s key specs and details. 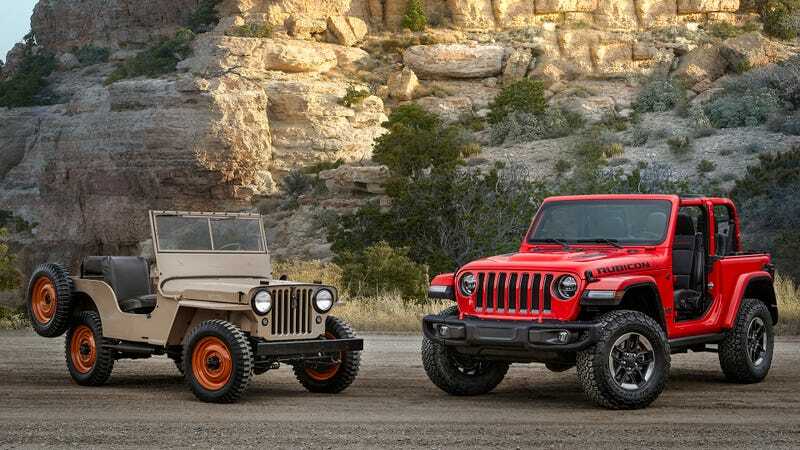 While we won’t be driving the new Wrangler until next week and we’re waiting for the company’s press conference to start any minute, a heap of new information hit the internet earlier to day from Road & Track’s Bob Sorokanich who drove the JL in New Zealand. The 3.6-liter Penastar V6 that’s been the Wrangler’s heart since 2012 (when it replaced a much-maligned 3.8 liter) will remain the default engine choice for the 4x4, though it’s important to note it is not a direct carry-over. Even though it has the same factory-claimed output of 285 horsepower and 260 lb-ft of torque. It picks up 2 mpg city, 3 mpg highway, per Jeep. That powerplant will apparently be paired to an all-new six-speed manual or an eight-speed automatic transmission. A 2.0-liter turbo four-cylinder rated at 270 horsepower and 295 lb-ft of torque is on the options list, and bowing in 2019 on four-door Wranglers only will be a 3.0-liter EcoDiesel V6 rated to 260 horsepower and 442 lb-ft of torque, hooked up to a unique version of the eight-speed automatic. The two-door Wrangler has grown by 2.8 inches in length, while the four door will be 3.8 inches longer. The wheelbases have stretched by 1.4 inches and 2.4 inches, respectively. Wrangler bodies are just 0.2 inches wider, but the wheels have moved further apart with an extra 2.5 inches of track width. Just like the now-outgoing “JK” body Wrangler, Sahara trim vehicles will get body colored fenders. Fenders on the Rubicon off-road trim are two inches higher, and the most-rugged model’s bumpers are now steel. The front is supposed to accommodate a Warn winch. The outgoing JK Wrangler was the benchmark for approach, departure and breakover angles, which dictate how steep of an obstacle the vehicle can scamper up or over. The new JL actually improves on those specs. The JK stood with a 42.2-degree approach, a 32.3-degree departure, and a 25.8-degree breakover. Jeep claims that the JL has a 44-degree approach, a 37-degree departure and a 27.8-degree breakover. The thing’s pretty much a damn mountain goat! The new Wrangler Rubicon will run 33-inch BF Goodrich KO2 all-terrain tires as standard, and apparently massive 35-inch tires will fit correctly with Mopar’s optional two-inch lift kit. Push-button start will be standard, and hopefully waterproof, along with a 7-inch touchscreen. An 8.4-inch infotainment rig running Fiat Chrysler’s Uconnect operating system is optional. A roll bar hoops over the Wrangler’s body, with tubes coming down at the A-pillars. The windshield is still removable, and better than that, supposed to be a lot easier to lower than it was on the outgoing JK. The rear-view mirror and even sun visors actually stay put too, as they’re mounted on a piece of roll-cage that spreads across where the top the windshield sits. The doors still come off too, and now they’re nice lightweight aluminum. Anyone who’s ever tried to dismantle a Jeep will appreciate that. The new Wrangler is loaded with pre-threaded off-road toys, but I was especially intrigued by reports of pre-threaded mounting points near the windshield and improvements to the roof. The 2018 vehicle’s roof will ship in a huge range of configurations, including a “no-walls” canvas mode, and a power-retracting soft top that’s like a giant sunroof. That one can be used at up to 60 mph, and no soft tops will have zippers, just grooves that should be a lot more durable. Seats will have MOLLE-style nylon accessory mounting points, for your satchels and tacti-cool purses. The 2.0-liter turbo will get an alternator-based mild hybrid system we’ll discuss later, and a PHEV is slated for 2020. Yeah, a true hybrid-electric Wrangler. Welcome to the future.